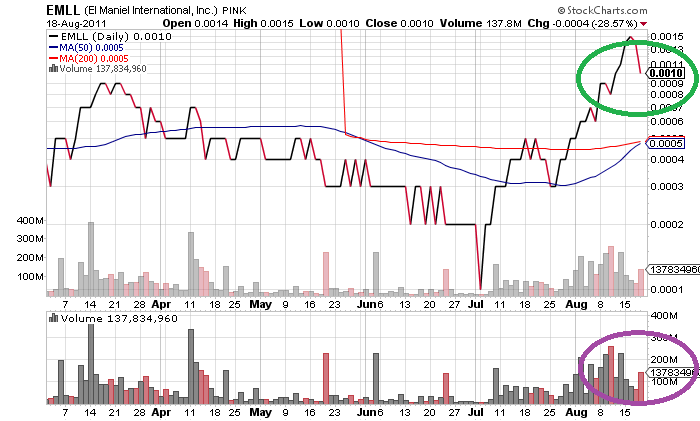 After some impressive gains over the past week, El Maniel International Inc (PINK:EMLL) crashed back down. The fall started on Wednesday and continued yesterday, when the stock lost another 28.57% of its market price. However, unlike the price decrease, the traded volume of EMLL reached over 137 million shares, which is quite bothering for investors. On Monday, El Manuel announced that the company was sending its mining project crew for pilot operations in Papua New Guinea and the stock price increased by 27%. Though, a couple of days later it took the way down again. Less than ten days ago, EMLL hit a massive gain on some positive news by the company. However, the projected revenues are still in the future. While, at the same time, the company's financials remain quite unstable. As already reported on hotstocked.com, as of June 30 this year the total assets of EMLL are higher than its liabilities, however, the company hasn't re-paid its long-term debt yet. Besides, it has incurred numerous expenses and a net loss that should be covered. According to the 10-Q, the actual results of El Maniel could differ from those estimates. Though, they would hardly differ that much.